One of the most important requirements of leadership is effective communication. The idea that some people are natural leaders and that others will never learn to show good leadership is now outdated. It has been replaced by the conviction that leadership and communication skills can be learnt. 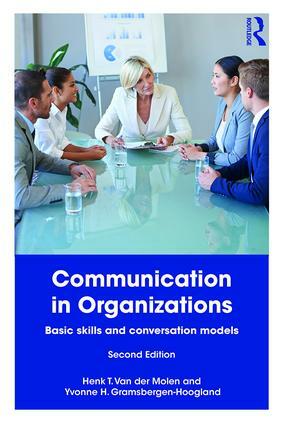 This second edition of Communication in Organizations continues to give clear advice and guidance on communicating in a range of different contexts in the workplace. From handling complaints and breaking bad news to negotiating deals and giving presentations, it explores the building blocks to effective communication skills, nurturing the leadership qualities required in any organization. By defining the abstract concepts of ‘organization’ and ‘communication’, it provides readers with the necessary skills to conduct any conversation on a professional manner. Illustrated with concrete examples throughout, this new edition includes a new chapter on career coaching, with exercises and ideas for role-play to enable the ideas to come alive. The three parts work seamlessly to expand the readers’ conversation skill-set as they progress through the book. Communication in Organizations is an invaluable resource for students of management and business psychology, as well as those taking courses who are already in the workplace. The practical aspects compliment both introductory and advanced courses in interpersonal communication, leadership and business and professional communication.